As corals continue to decline in abundance around the world, researchers are turning their attention to a possible cause that's almost totally unexplored  viral disease. It appears the corals that form such important parts of marine ecosystems harbor many different viruses  particularly herpes. And although they don't get runny noses or stomach upset, corals also are home to the adenoviruses and other viral families that can cause human colds and gastrointestinal disease. "Coral abundance in the Caribbean Sea has gone down about 80 percent in the past 30-40 years, and about one-third of the corals around the world are threatened with extinction," said Rebecca Vega-Thurber, an assistant professor of microbiology at Oregon State University. "We've identified 22 kinds of emerging disease that affect corals, but still don't know the pathogens that cause most of them," Vega-Thurber said. "Most researchers have looked only at bacteria. But we suspect viruses may play a role in this as well, and it's important to learn more about what is causing this problem. Corals are the building blocks of the tropical seas." A research program at OSU, one of only two of its type in the world, is studying viral "metagenomics" in corals, meaning the analysis of multiple genomes at the same time. It may help explain one of the underlying causes of coral decline, Vega-Thurber said, and is one of the most comprehensive analyses yet done on the types of viruses in a marine animal. It may also shed light on the broader range of viruses that affect not only corals but many other animals, including humans. One of the surprises from recent research was the predominance in corals of herpes viruses  similar but not identical to the herpes virus that can infect humans. Herpes viruses appear to constitute a majority of the viruses found in corals, and one experiment showed that herpes-like viral sequences were produced in coral tissues after acute episodes of stress. "We were shocked to find that so many coral viruses were in the herpes family," Vega-Thurber said. "But corals are one of the oldest animal life forms, evolving around 500 million years ago, and herpes is a very old family of viruses that can infect almost every kind of animal. Herpes and corals may have evolved together." It's not yet certain, researchers say, whether the viruses being found on corals are actually causing diseases. "Just because you harbor a virus doesn't mean you are getting sick from it," Vega-Thurber said. "This is part of what we have to pin down with further research." 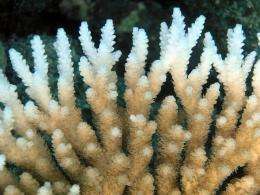 Some of the possible causes of coral decline that have been identified so far include global warming that causes coral bleaching, loss of symbiotic algae that help nourish corals, pollution such as sewage runoff, and human-coral interactions. A "mucus" sometimes found on corals can harbor human-borne viruses, and levels of these viruses have been correlated with terrestrial human population density. "We have found that nutrient increases from pollution can cause increased levels of viral infection, as do warmer water and physical handling," Vega-Thurber said. "Now we have to determine if those increases in infection cause actual diseases that are killing the coral." Research is "likely to reveal that viruses have numerous and profound roles on coral reefs," the scientists wrote in their study. "As the diversity, distribution and function of reef-associated viruses becomes increasingly well defined, so will our ability to predict, prevent and/or mitigate disease epizootics on coral reefs."